Sponsors help maintain our financial viability and help keep our fees low. 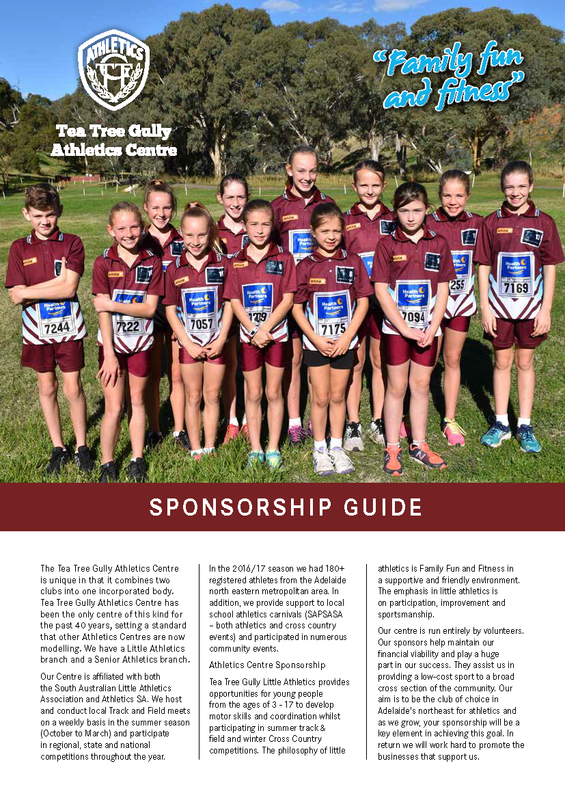 The organisation is seeking sponsorship for our Little Athletics and Seniors clubs. If you feel your company would appreciate being associated with a highly successful community based club that has existed for over 30 years promoting healthy, fun family activities in one of the fastest growing council areas in S.A., please Contact Us to begin a new community partnership or for further information. Our Centre will be appreciative of any form of sponsorship through monetary donations or donations of goods and or services to assist in fundraising activities. Providing graphic design, print management, digital printing and advertising advice. 20% off for all TTGAC members. TTGAC athletes and family members receive a 10% discount on all services every day of the year!. Providing a range of breads, sweet and savoury rolls, and pastries. For a friendly service and quality meat you can afford. Dimples provides catering for club events and private functions. Meals and snacks are available at a variety of times for members and guests. Specialising in remedial massage, deep tissue work and sporting injuries. Wide range of hot pastries and cakes. Mmmmm! No order too small or large. A family owned business, INTERSPORT Tea Tree Plaza has always endeavoured to provide the highest quality sports footwear, clothing and equipment at nationally competitive prices. Latest styles, trends, and technology are at the forefront of our thinking. Call Jason a master plumber and gas fitter providing plumbing and gas services in the Adelaide region. Whether you are looking to purchase your first home, or refinancing, or investing, call or email Pam for your complementary appointment. Pam is a mobile lender who comes to you. Custom uniforms for sporting organisations. Providing haulage services across Australia and suppliers of quarry material, landscape and clay products. Sam is a real estate agent who specialises in the North East. From prestige homes to units, Sam can also help with all types of property sales such as subdivisions, land, commercial sites including boarding kennels, coffee shops, abattoirs and more. A $500 spotters fee applies to TTGAC.